Image from Charles Guan’s Website of the 2.00GoKart Summer Race. One beautiful summer day, I was sitting on the starting line of a 2.00GoKart outlaw race in LoLrioKart. (Its called an outlaw race because these vehicles weren’t constructed in the class, nor did they follow the class wattage limit. LoLrioKart has more power than the rest of the 2.00GoKarts combined.) Charles shouted 3, 2, 1, GO! 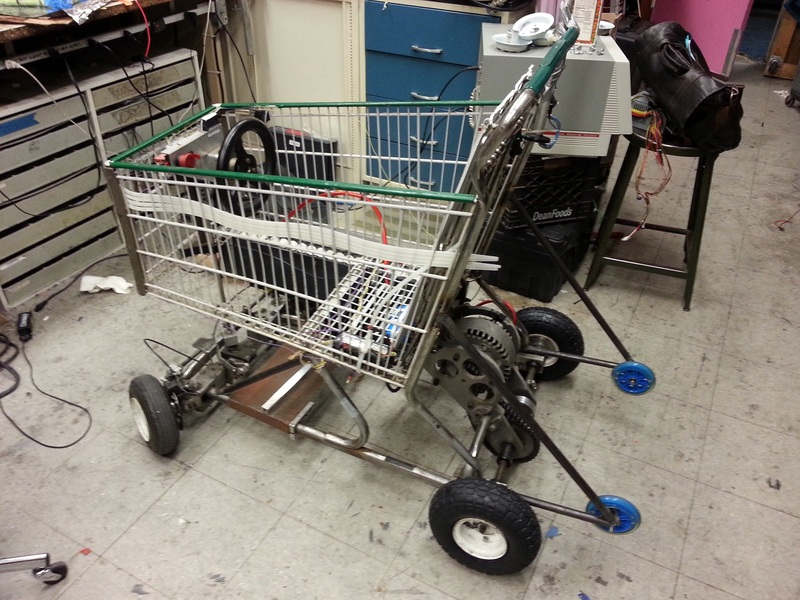 LoLrioKart, with a 40V (infinite)A A123 battery pack jumped forward, pulling a huge wheelie, scaring me to death. I let up on the throttle long enough to bring the front wheels back onto the ground. After that, I floored it again, pulling a second, more reasonable wheelie. I realized I needed what drag racers need: a wheelie bar. LoLrioKart now pulls wheelies without fear of doing a backflip! LoLrioKart is so powerful that flooring it from a stop lifts the front wheels off the ground, rotating backwards with such momentum that the back wheels also lift off the ground for a second, riding entirely on the little blue wheelie-bar wheels. With a passenger on the back, LoLrioKart can pull 2-person indefinite 25mph wheelies! 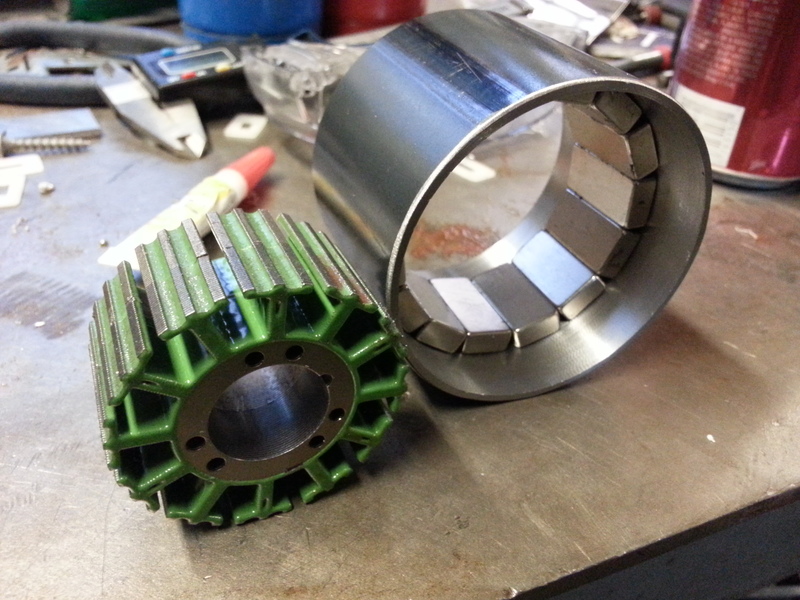 I test-fitted the new stator in the motor casing, and IT FIT WITH LESS THAN 1/4MM OF GAP BETWEEN THE STATOR AND MAGNETS! Even better yet, it has the same mounting holes as the first one! 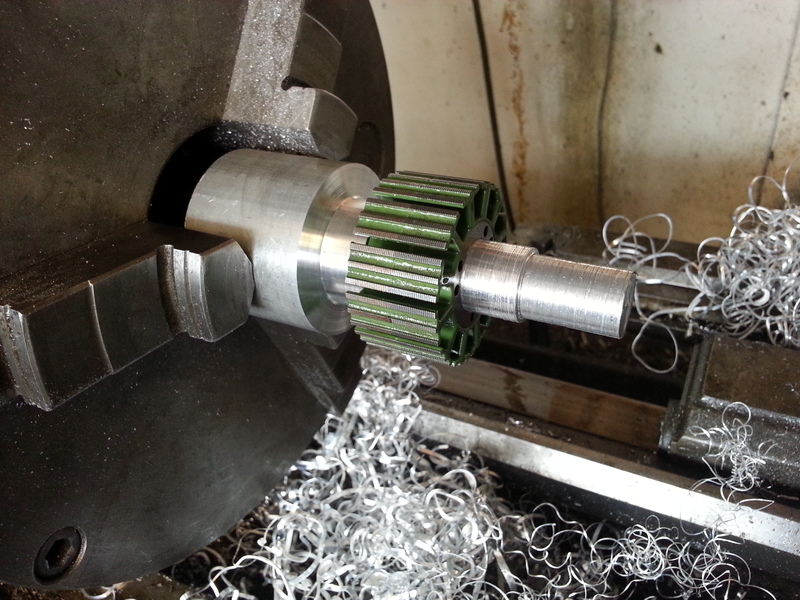 I’ve installed it and tried turning the motor by hand, and the magnetic cogging is insanely strong. All the torque is mine! 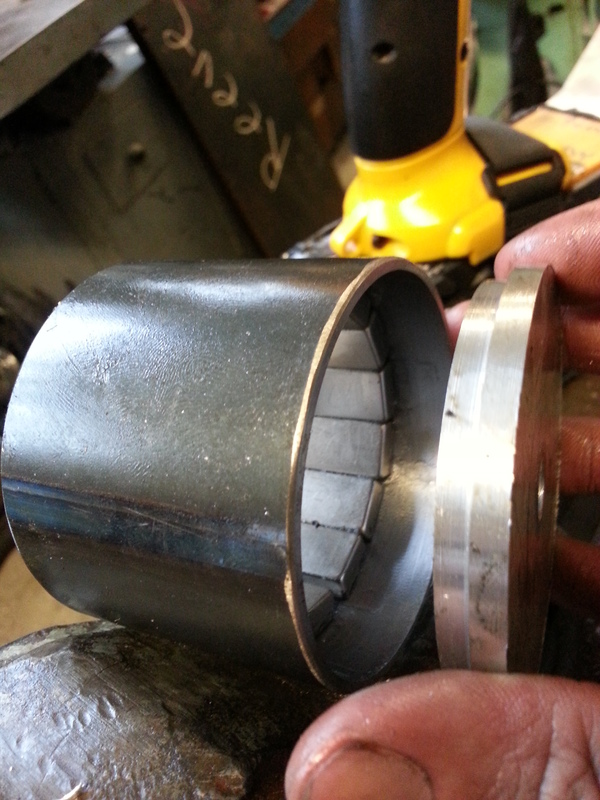 I’ll wind the new stator soon and show everyone how it goes! Refuse to walk home, and see what happens! It features a tiny brushless outrunner designed for an electric RC airplane, an RC airplane speed controller, a chain, a 6s4p a123 battery pack, and some (100’s of meters) of duct tape. 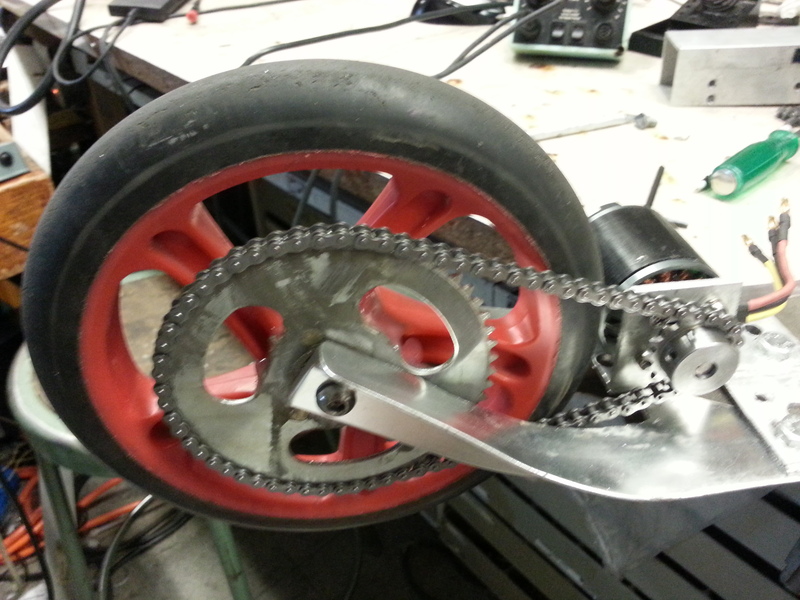 It was amazingly difficult to fit the chain through the tiny space between the wheel and frame, but I did it! After that, it was all duct tape! Total build time: ~2 hours. In the near future, I plan to replace that massive battery pack with some RC airplane LiPos, which should fit entirely inside the scooter deck. Over the summer, I will hopefully make a hub motor for this as well. Stay tuned! 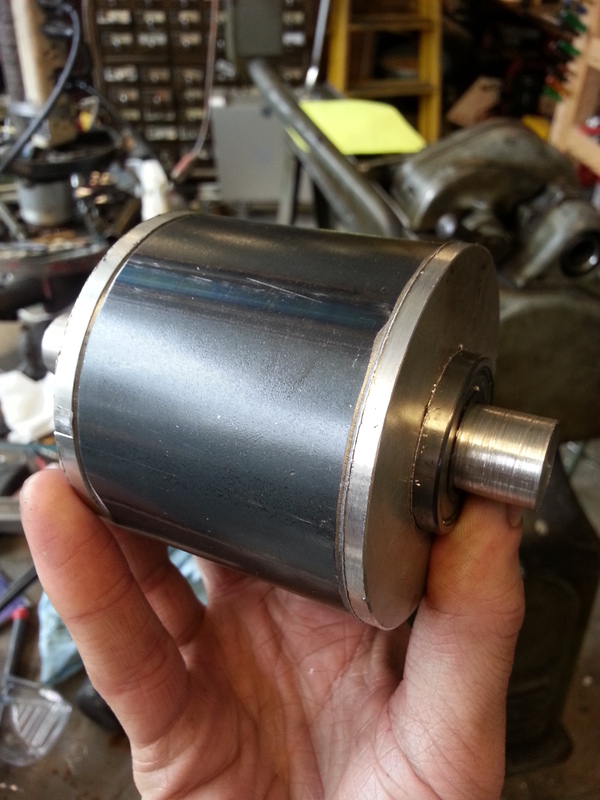 A friend at MITERS handed me a pile of electric motor stators (the fancy-shaped, laminated, magnetic steel cores at the heart of many electric motors) and I knew immediately that I was going to build a hub motor. 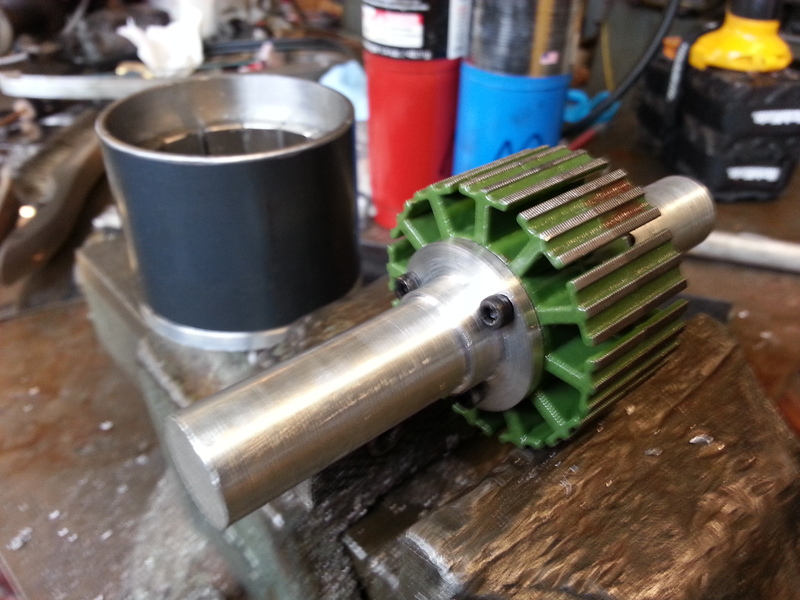 It turns out building a hub motor isn’t as terribly hard as it seems. The basic idea is to build a brushless outrunner (the type of motor you see on RC airplanes) with really strong sides and bearings. 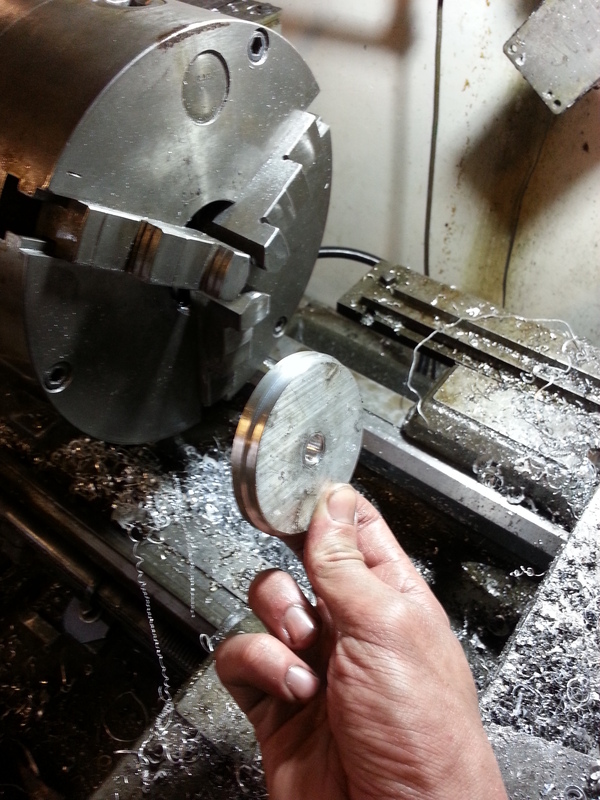 Thanks to the magic of MITERS, I had access to bearings, raw aluminum, steel tube, super-strong magnets, wire, and a stator. 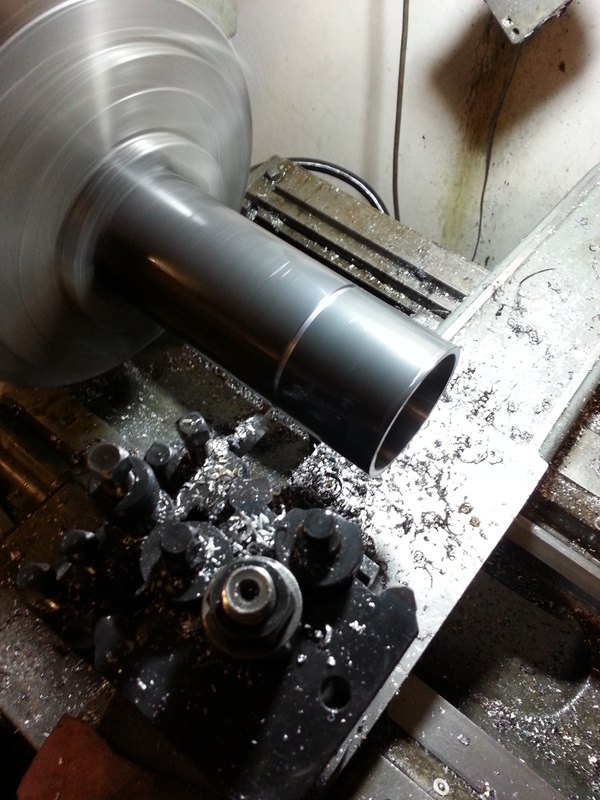 I started out with a massive steel pipe (it needs to be steel for the magnetic properties). 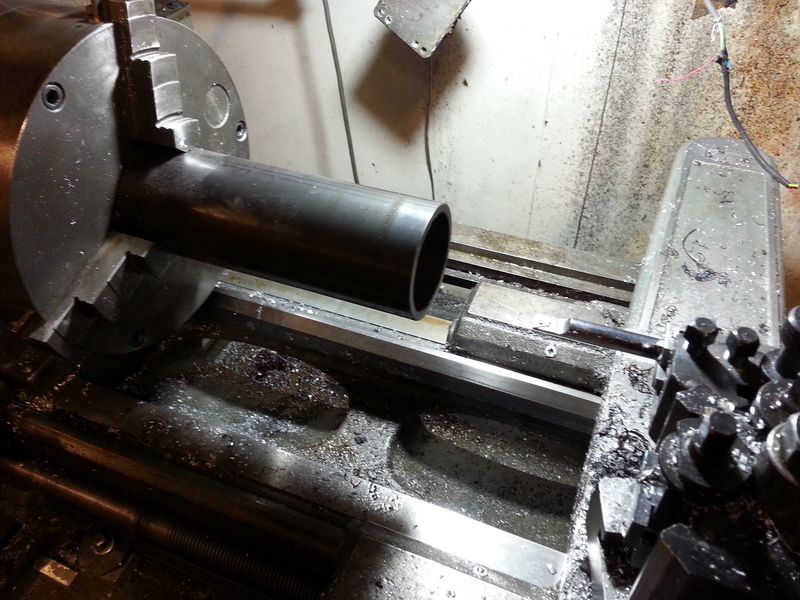 The inner diameter of this pipe was too small, so I had to lathe some metal off of the inside walls. 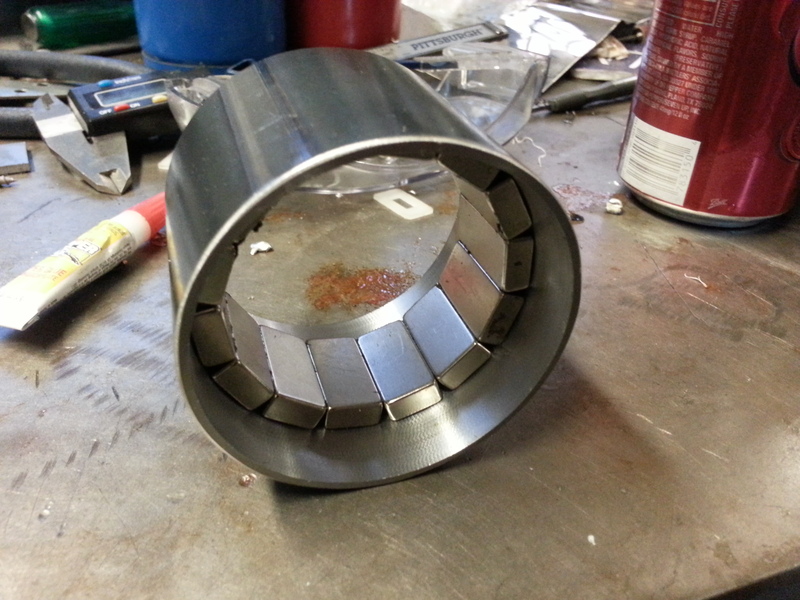 After a very long time (steel is very slow to machine compared to aluminum), I had removed enough steel that the magnets and the stator fit together in the tube. 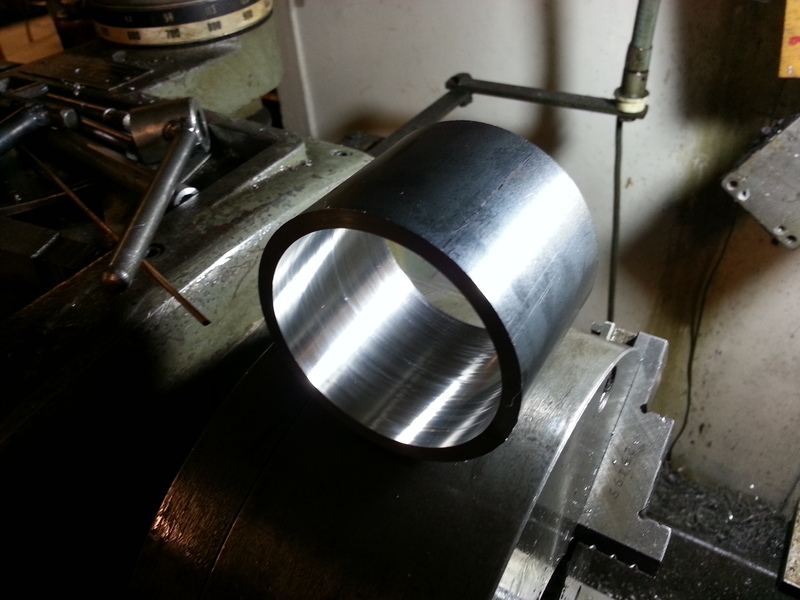 I used the lathe to cut the piece off of the end of the tube. The next step was to glue magnets to the inside of the tube. I decided to do a test-fit of all the magnets, and it turned out to be a lifesaver! I put all the magnets into the tube, and at the end, counted. 13 magnets. 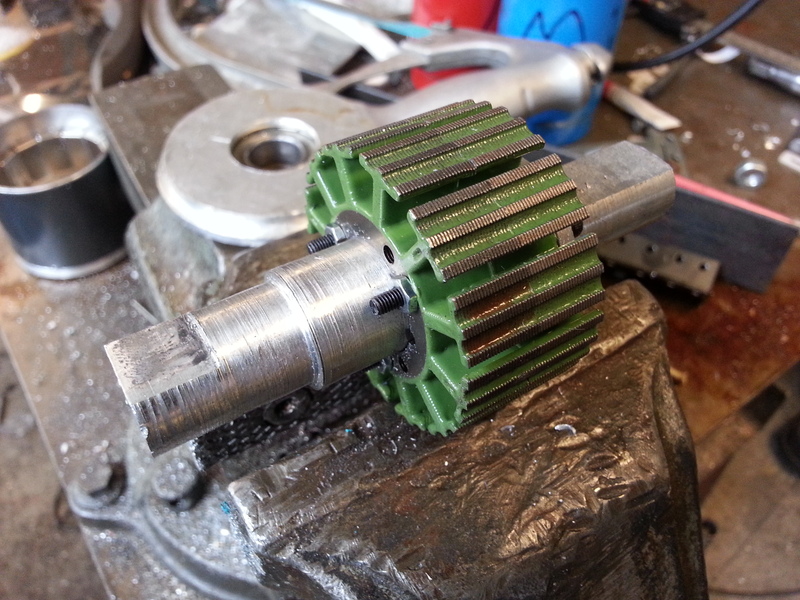 Precisely 1 less than necessary for a functioning motor! 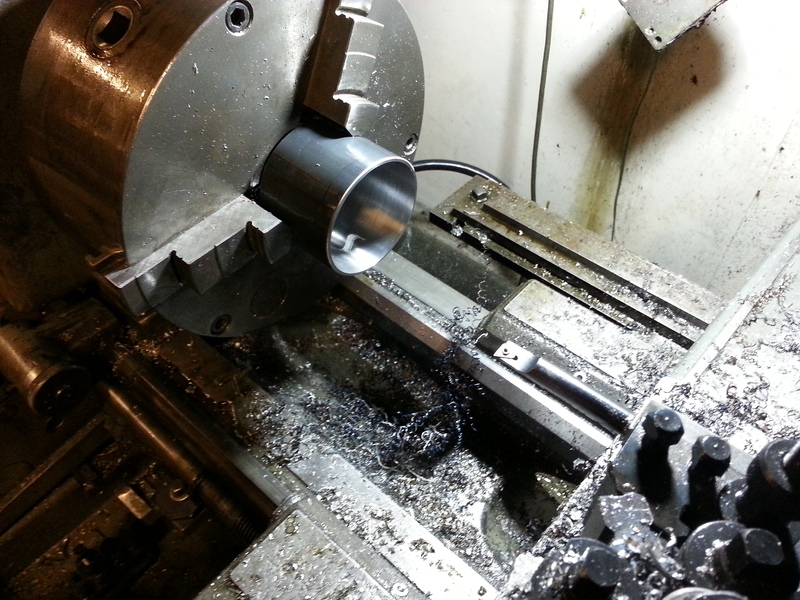 Having caught this potential disaster, I put the tube back in the lathe to make room for one more magnet. 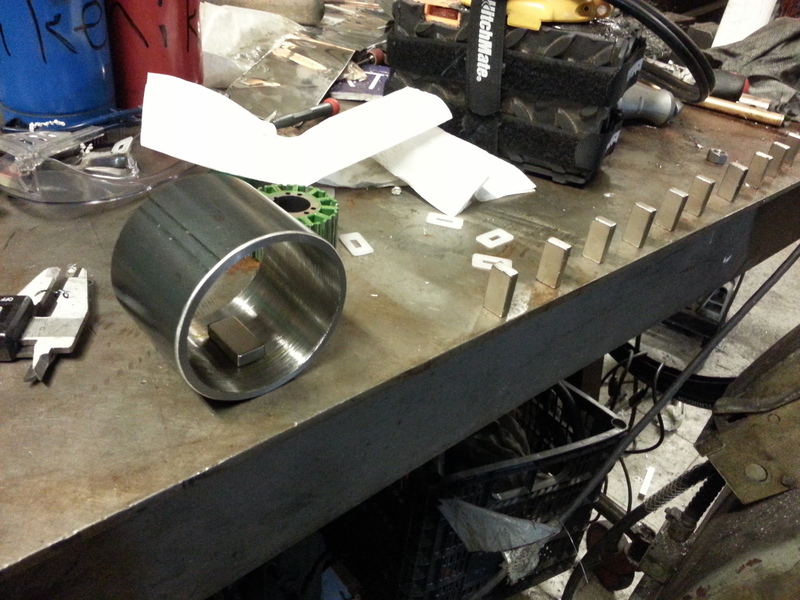 After making it the correct size for 14 magnets, I began the magnet attachment process. 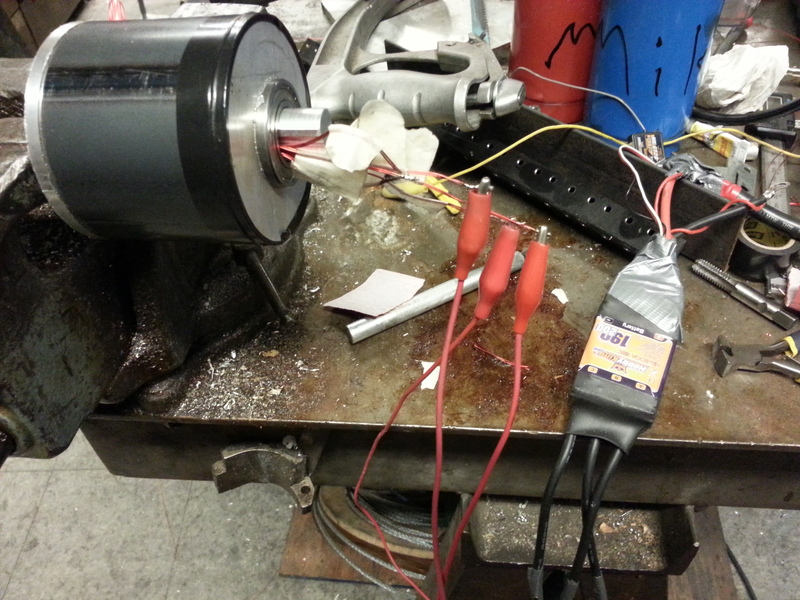 I used one magnet sitting on the bench to test the polarity of each magnet before putting it into the motor. Having one backwards causes the motor not to run! One thing to note about super-strong magnets near other super-strong magnets is that they can really jump to each other. I almost pinched the skin of my fingers a few times, which would have been absolute pain. 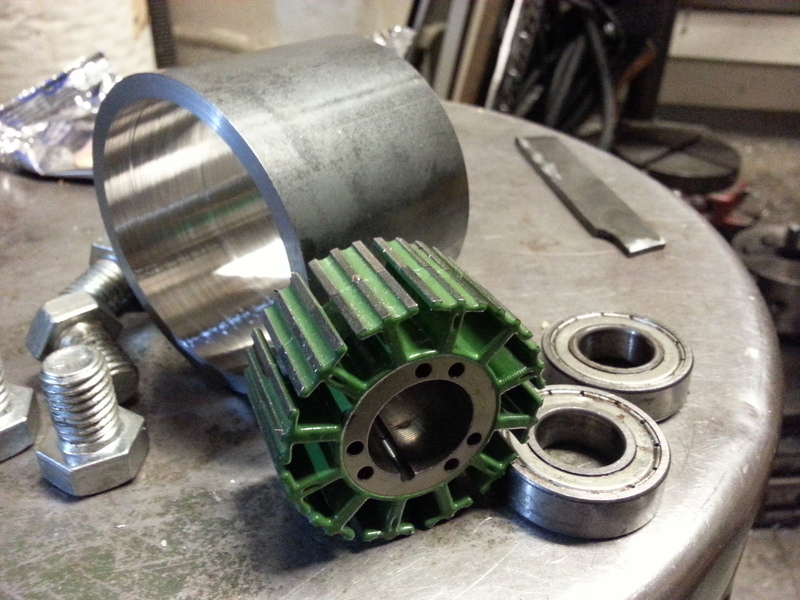 Eventually, I had all the magnets glued into the motor. 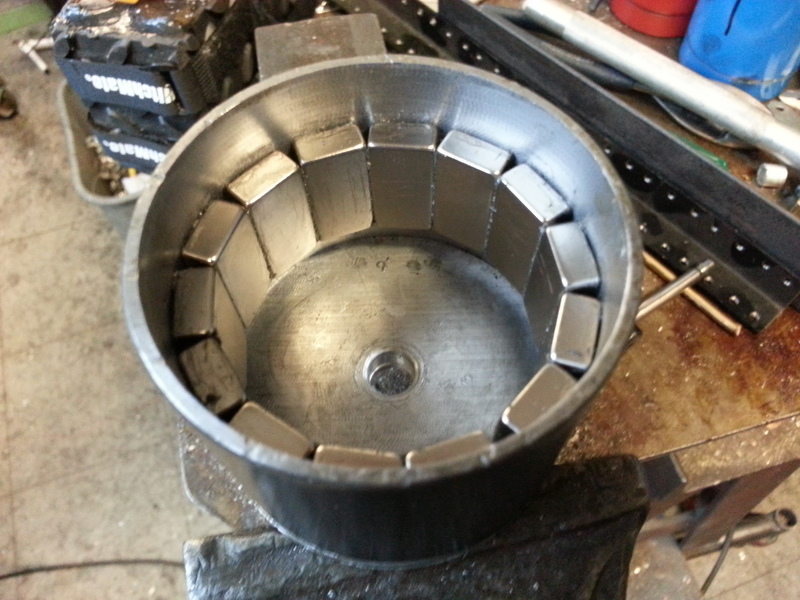 Next, the motor needed endcaps. 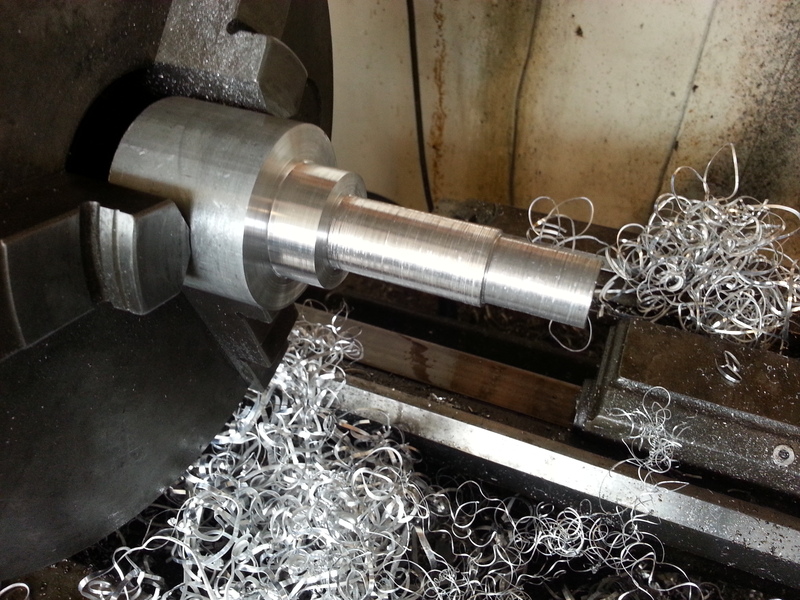 Thankfully, these do not need any fancy magnetic properties, so I could use aluminum! 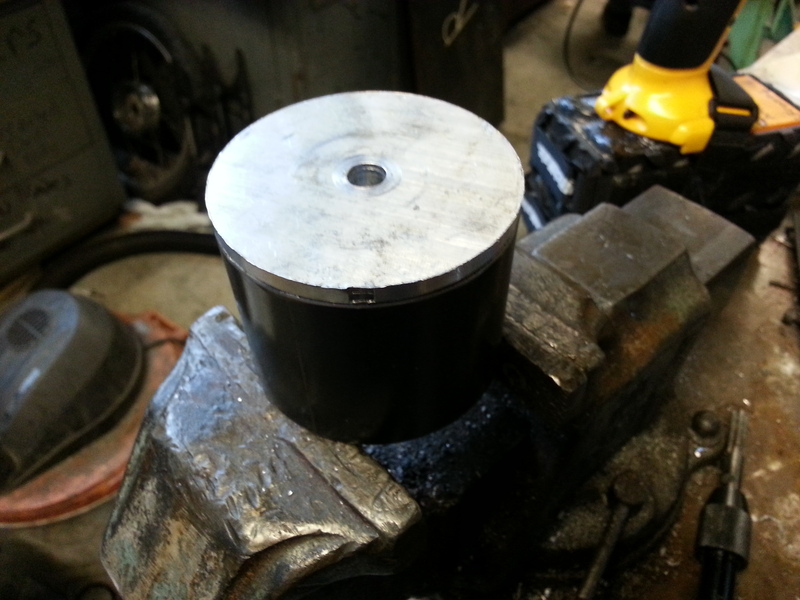 I spun an endcap on the lathe that would fit partially inside the steel pipe, with a lip around the edge to keep the cap in place. That endcap was a very snug press-fit, and would not be going anywhere. 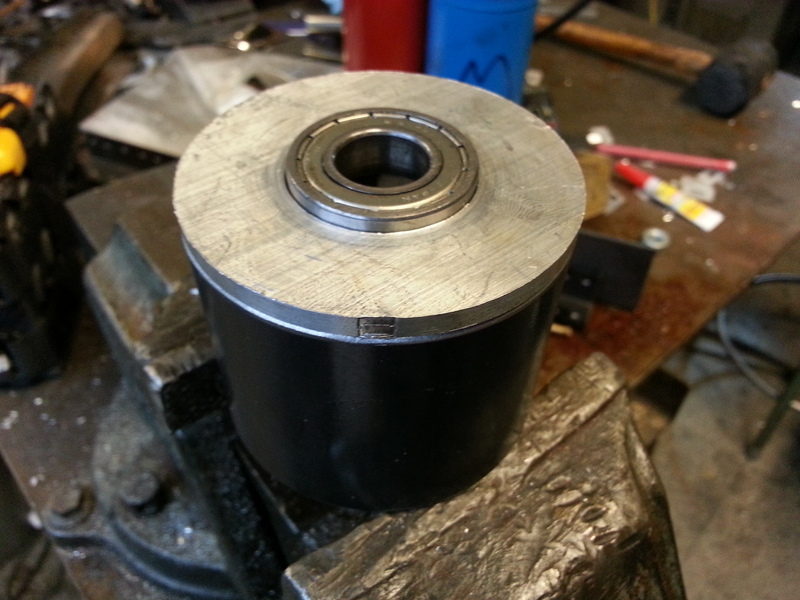 Once the endcap was pressed in, I could lathe a space for the bearing and axle. Boom! 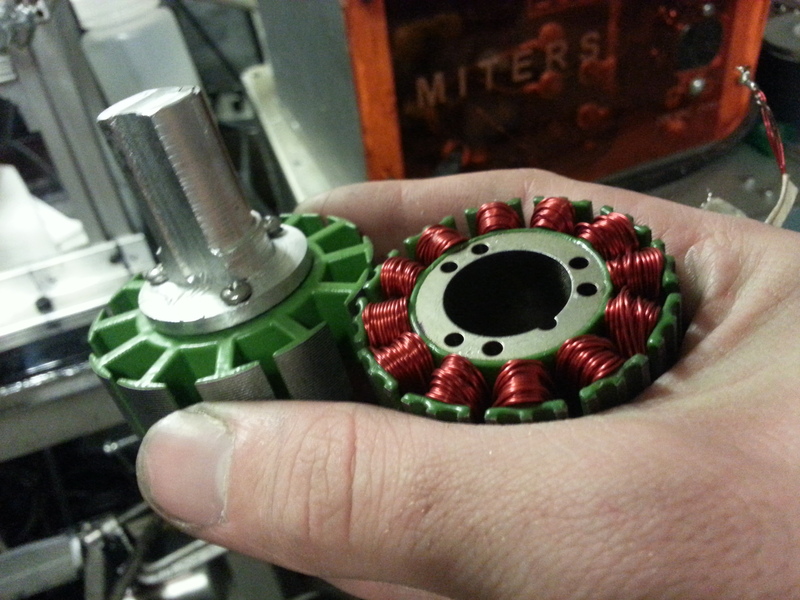 Beautiful, concentric bearing installed in the motor. 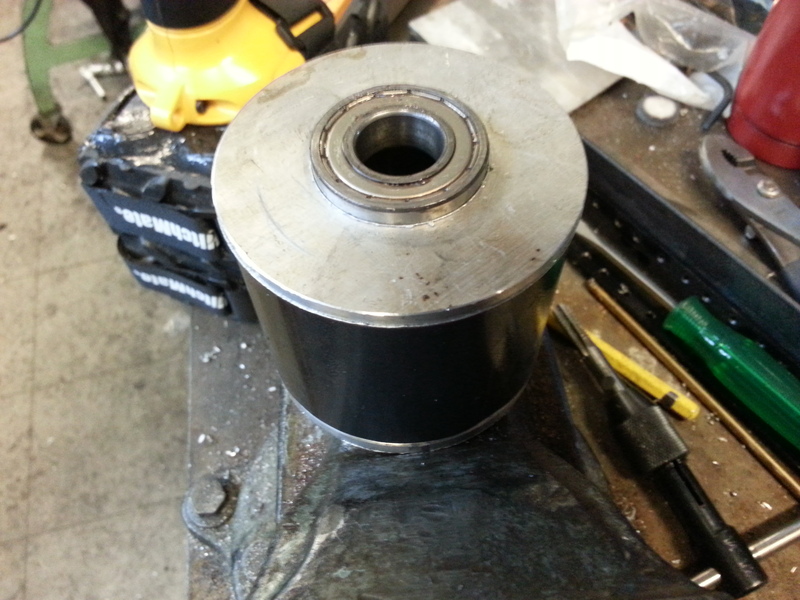 Next, I made another endcap for the other side of the motor. It began looking like a real motor at this point! 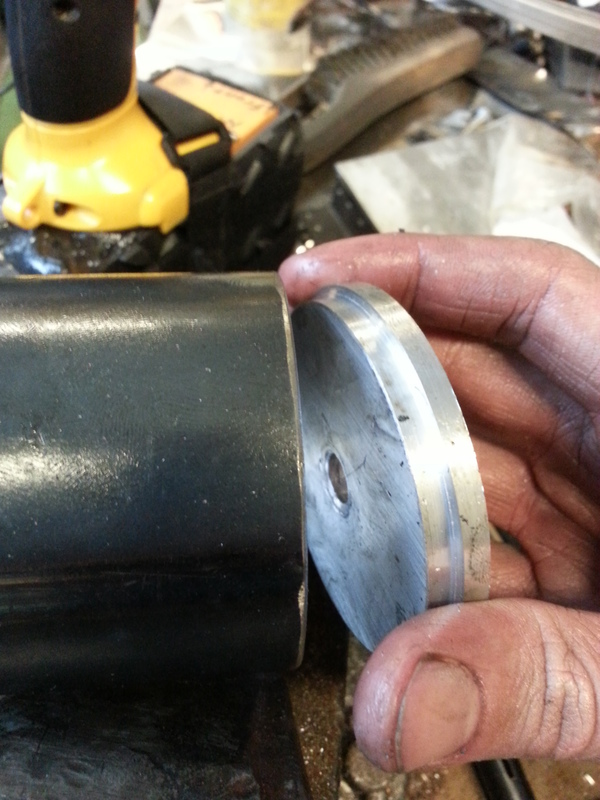 Next, I had to make a rather complicated shaft to hold the stator and bearings. Many aluminum shavings were produced that day. 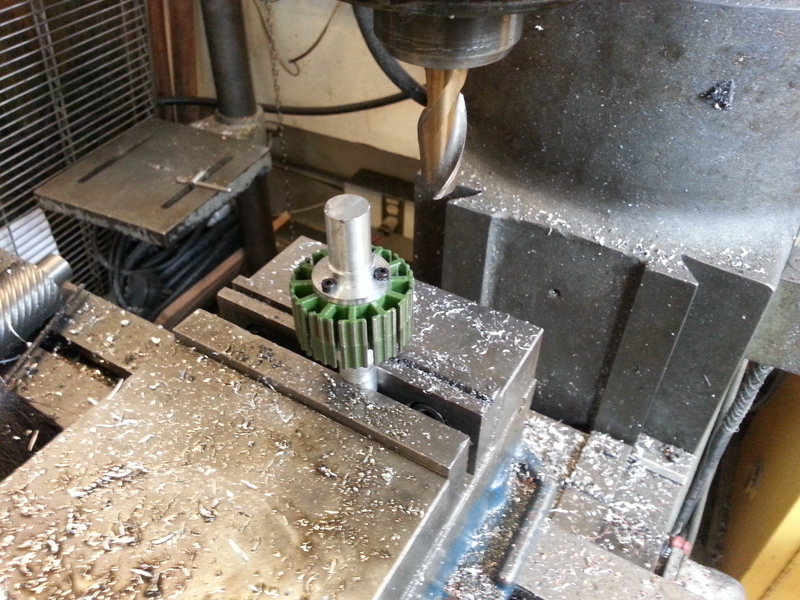 After machining the other side, I drilled holes and used bolts to keep the stator from spinning on the shaft. 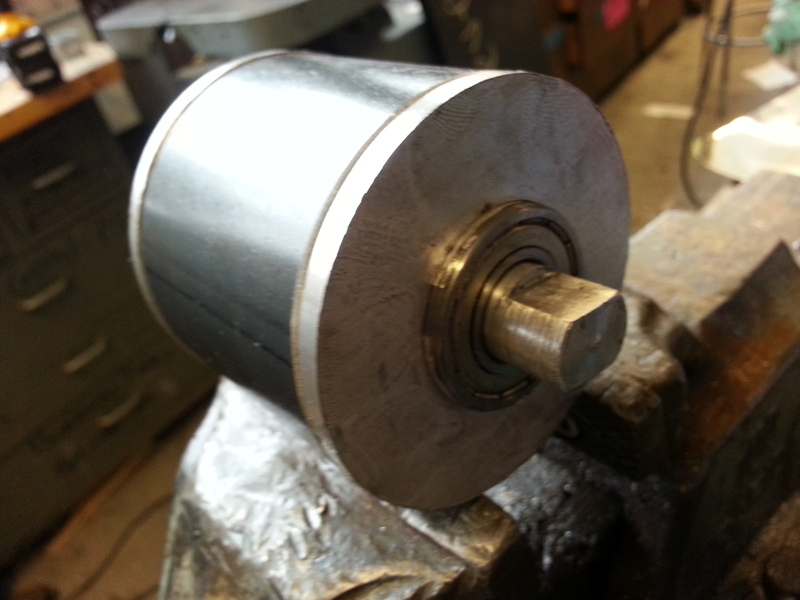 Next, I had to mill flat-spots into the shaft, since the axle on hub motors is torque-bearing. 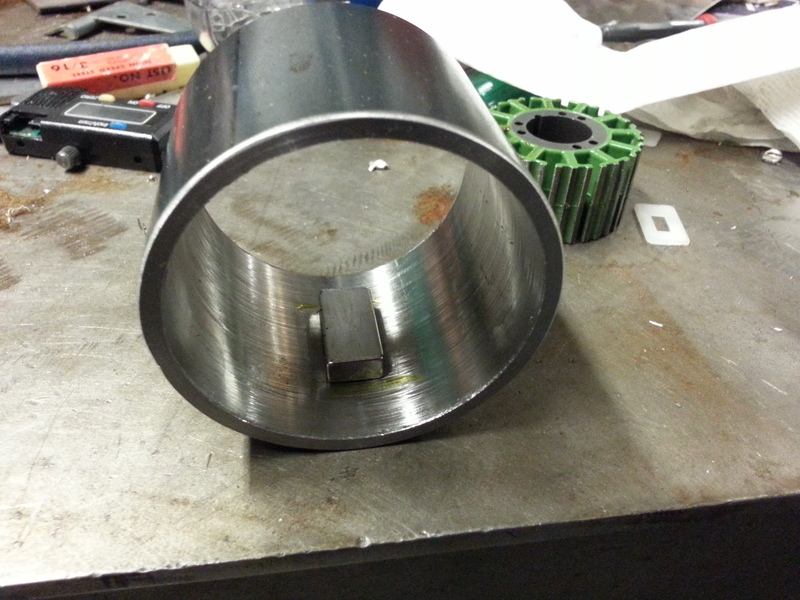 Finally, I had to do one of the most tedious part of the project: wind the stator. I didn’t try to absolutely maximize wire density this time, since I knew I would be re-winding this motor after feeling how much torque/speed this winding delivered. 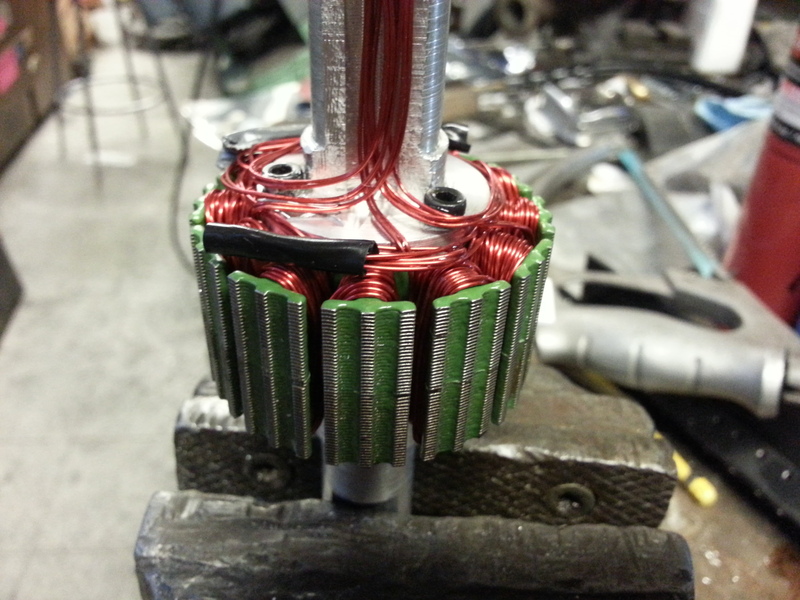 As you can see, all the wires have to exit through the bearing’s inner hole, since the rest of the motor spins. 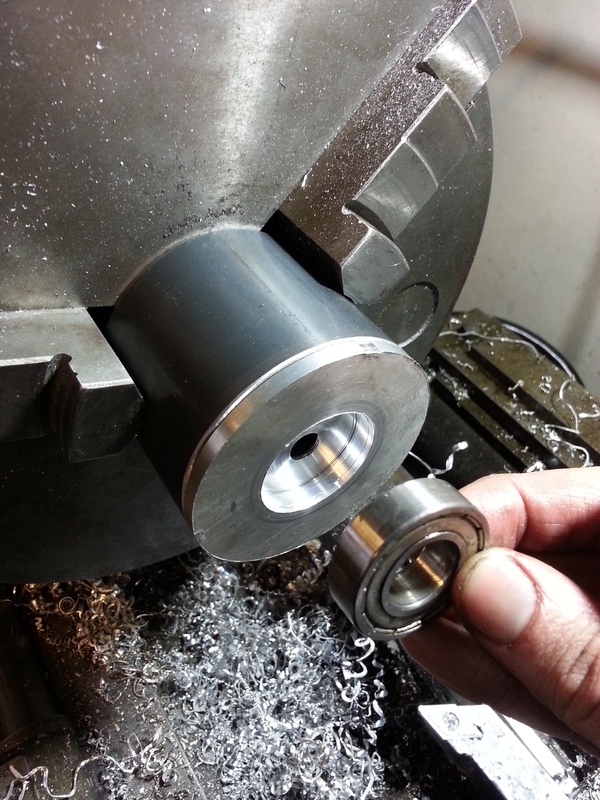 I packed them against the shaft and slipped the bearing over it. At this point, it is a complete hub motor! I’m still working on getting it to spin (either my tiny airplane speed controller can’t handle the massive inductance, or I soldered one of the wires backwards). 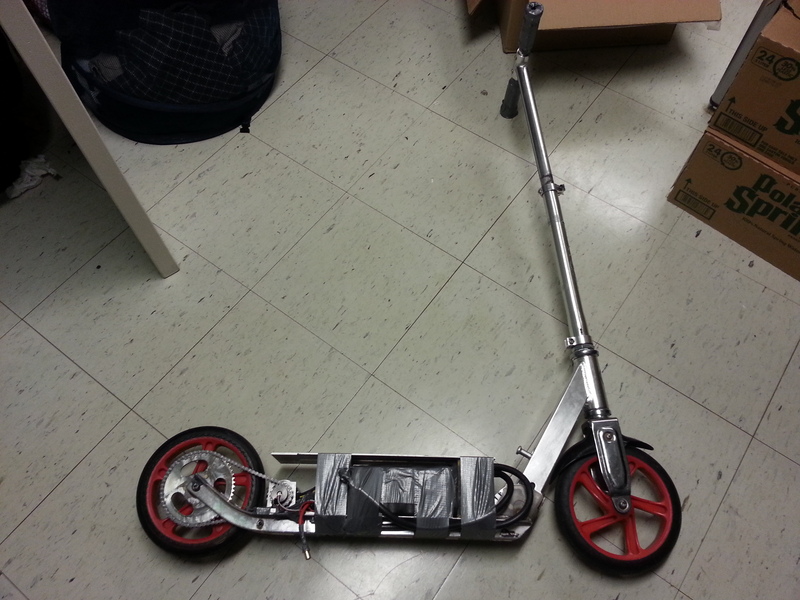 Predictions for the future: HUB MOTOR ELECTRIC SCOOTER! Oh yes, my first post! It is worth saying that Swapfest, a giant swap-meet near MIT that funds MITERS, is a very dangerous place for tech-people like me. I saw a vaccum tube, I bought a vaccum tube. That pile of lovely insanity is an audio amplifier using said vaccum tube, made in about 3 hours. It features insanely-oversized caps to eliminate 60hz buzz, and a vaccum tube that glows red when I push it.